Would you like to make a handpan recording and be able to keep a record of your compositions and ideas? Would you like to film a video, put together four or five songs, or even release a professional-sounding CD? There are so many different reasons for wanting to buy recording gear! The problem is, you’re never exactly sure what you need. You have undoubtedly trawled through the internet to try and find what’s right for you, but feel lost amongst all the information available. Don’t worry, you’re not alone! Finding the right equipment for your handpan can be tedious; that’s why we decided to look into the issue with the help of Alexandre Chaigne, a professional sound engineer and handpan lover. He has been recording handpan albums for a number of years, including OLOJi, Laurent Sureau and TwinPan, and mics up players for live stage performances. Here is everything you need to know! Basically, it all depends on two things: your budget and your goal. 1 – With a computer. 2 – Without a computer (we call this “the portable solution”). 3 – With a smartphone or tablet. In this article we will be looking at configurations 1 and 2. Configuration 3 will be discussed in a separate article, at a later date. So, let’s take a look at these first two configurations (which are also the most commonly used): their advantages, disadvantages, and what equipment is required according to your budget. There really is something available to suit every budget. You can start out with something relatively basic and upgrade your equipment over time. With a computer there are more options and versatility for sound recording. For example (and to make life easier), you can add a click (metronome), or add reverb, you can build up many different tracks…in short: many possibilities! Recording in this way requires some setup time- you need to take this into account if you don’t have a room dedicated to recording, for example. (Please note, we are simply saying that if you want to record an idea or composition straight away, you’ll have to factor in 10 minutes to turn on the computer and all the kit – we will be discussing- that goes with it). Also bear in mind that the total cost can be higher than with the other configurations. In concrete terms, you will need equipment to transfer the sound of the handpan to the computer. We are assuming here that you already have a handpan and a computer, which is why we are only talking about microphones and sound cards. These tables present the different microphones (small and large membrane) and sound cards available according to your budget. 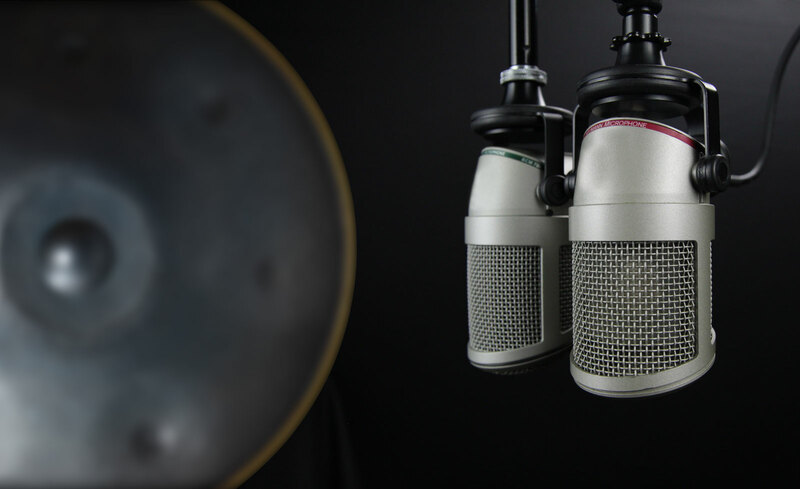 The price shown in brackets for each microphone denotes the price for a pair: stereo recordings are always better, and having two microphones will turn out to be very useful for recording two handpans simultaneously. Note: if you would like to learn more about the different types of microphones and their specificities read our article How to choose a microphone for the handpan? What can I do with this equipment? You can expect good quality, satisfactory recordings of your ideas and compositions. You will have also great fun doing so, but remember that you won’t achieve the quality of a professional recording studio. We are talking here about home studio. Note: if you don’t want to spend as much on this kind of equipment, you can buy a single microphone instead of a pair. The result will be the same; you will just lose the stereo aspect. What can I do with this equipment? Ideal for sharing your music online and shooting videos with high quality sound. What can I do with this equipment? Perfect for professional quality recordings such as for an EP, album, etc. First you have to differentiate between a recording device that has a built-in microphone and one that doesn’t. Recorders with a built-in mic range from a basic dictaphone to a professional recorder with the option to add extra mics. Recorders without a built-in mic are intended for audiovisual recordings such as documentaries and films, and so are of a higher quality. With this configuration you can record wherever you like and without the need for a mains power supply. The setup is much quicker than a computer-based configuration- the only time-consuming part being the configuration of the recorder and learning how to use it after you have bought it. Once everything is configured, as soon as inspiration strikes, you can get it out, press “record” and you’re up and running! So, you don’t need a mains supply, but you will have to consider your battery life. And if you want to upgrade your device, apart from adding microphones, it will be more difficult to get top of the range without having to buy a new, better quality recorder. What can I do with this equipment? Allows you to record your ideas anywhere or very quickly, like at jams or when busking, etc. What can I do with this equipment? Ideal for recording videos and jams whenever and wherever you like. Note: we will now move on to recorders (column C) with a built-in microphone, but that also have the option to connect extra microphones (cf. columns A and B). What can I do with this equipment? Of course, you can achieve everything this is covered in the previous budgets, but expect a much higher quality. This equipment will allow you record an EP or LP anywhere, indoors or outdoors, as well as live sessions, with a near-professional quality. As you can see, there really is something for everyone! So, here are a few tips on how best to equip yourself within your means and according to your needs. Decide on which configuration you want: with or without a computer? Consider your requirements: do you want something that’s convenient and quick to set up? For example, are you often on the road, outdoors or busking? Do you like to jam, go to festivals and want to capture the moment? In which case, you should opt for a portable recording device. Or, are you are often at home, have spare time, like to explore different possibilities and would like to use software that allows you to re-record, edit and arrange your compositions at your leisure? If so, we would recommend you opt for the configuration with a computer. Ask yourself whether you’re willing to break into your savings… in short, decide on your exact budget and stick to it when choosing what to buy. Make your choice from the product listings presented in this article. With regard to the medium and high budget suggestions you can put your faith in us: we have either already tested the equipment, seen it in action in professional studios, or know that it is a trusted, quality brand. The equipment is just the tool; the most important thing is how you are going to use it. Listen! Put the microphones in different positions, test them out several times, change rooms, etc. : trust your ear and tell yourself that what counts in the end is the music… music that sounds alive!